Most of us are friendly with google chrome. And why not ? It is most loved web browser these days. So google chrome came with many in-built functions but there are many people who are not aware of these. This time we will introduce you to the Hidden game inside google chrome. Well this game is just for time pass and include little graphics. Or You can say it is without any graphics but you gonna loved this game. 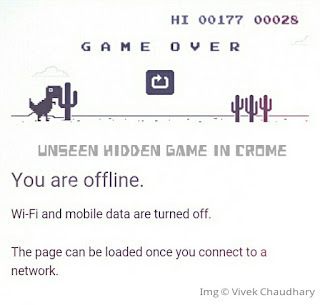 Its not a candy crush or temple ran but a simple game which has a dinosaur running in desert . There are few hurdles while moving. You have to play safe and just jump whenever a tree came. Your scores will appear at the top right corner with previous Highest (HI) score. This game is not only for PC/Laptops users but you can even play it in your Mobile phone. Many of us have android phones today. So you just need to update your google chrome with the latest version. I haven’t checked it in any other phone except android, so you can take a try to play it in apple phones if you have and also let us know whether its working in it or not in comment box. How to play it in PC ? 3. Just search for anything at the url bar. 5. Now you are just 1 click away to play the game. In the error page you will see a dinosaur. You have to click on it and then press the up button from your keyboard and you will notice the dinosaur will start moving. This game use only single button to play. You just need to jump the dinosaur over the hurdles using Up keyboard button. How to play it in Android phone ? Ohk.. So you are here to read because you own a android smartphone and wanna play this game in it. First of all you need to update google chrome with the latest version. Just update it from play store. If you already have updated version, then don’t need to worry. 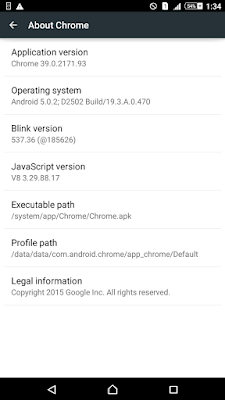 In below picture we have shown google chrome with application number 39.0.2171.93 .Before playing game check whether you have this version or not. More updated will also work. If you don’t have this version then take a one try to get whether it will work or not in your present version. If not, then update it. 2. Search for anything and error will appear for not being connected to internet. 3. Now in error page you will see a dinosaur. Single tap it with finger touch and it will begin to run. Play and enjoy. Please comment below if you find any problem and let us rectify it.